Here in Colorado, summer is breezing along. It’s been a summer of exploration, discovery, and reflection. Early on, I did some traveling. In June, my father and I went on a trip together to Alaska, just the two of us. It was the trip of a lifetime. 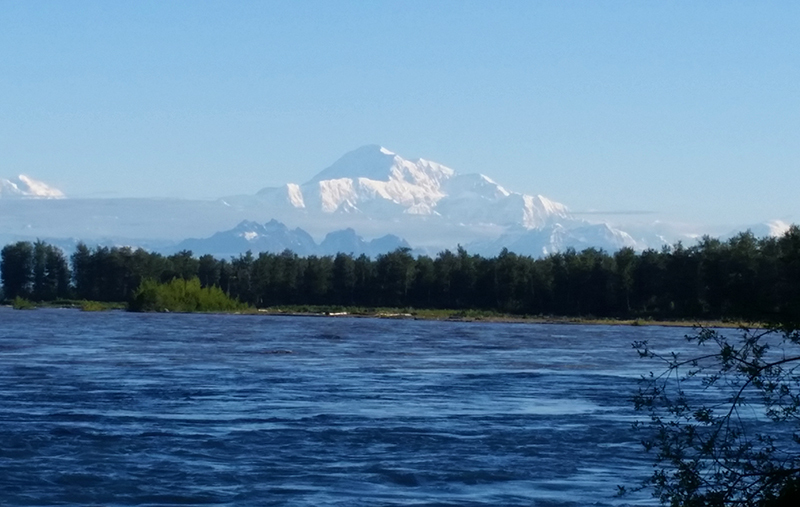 We flew around Denali in a Cesna, took a jet boat up the Susitna to Devil’s Canyon Gorge, watched the Aialik Glacier calve into the bay in Kenai Fjords National Park, and hitched a ride with the sled dogs at Seavey’s Iditarod Tours in Seward. We saw moose, black bear, bald eagles, bighorn sheep, puffins, porpoises, sea lions, otters, and humpback whales! Then earlier this month, Shelby and I, along with his dad and his dad’s girlfriend Dottie, road the Cumbres-Toltec train from New Mexico to Colorado. The route is full of switchbacks and turns around some beautiful country and steep mountain cliffs. Returning from these outdoor adventures, I have been keen to get outside as much as possible to enjoy Colorado nature, but to tell you the truth, it’s been just too darn hot. In the end, it all worked out because I have a lot of crocheting and designing to do, which I like just as much as being outside! 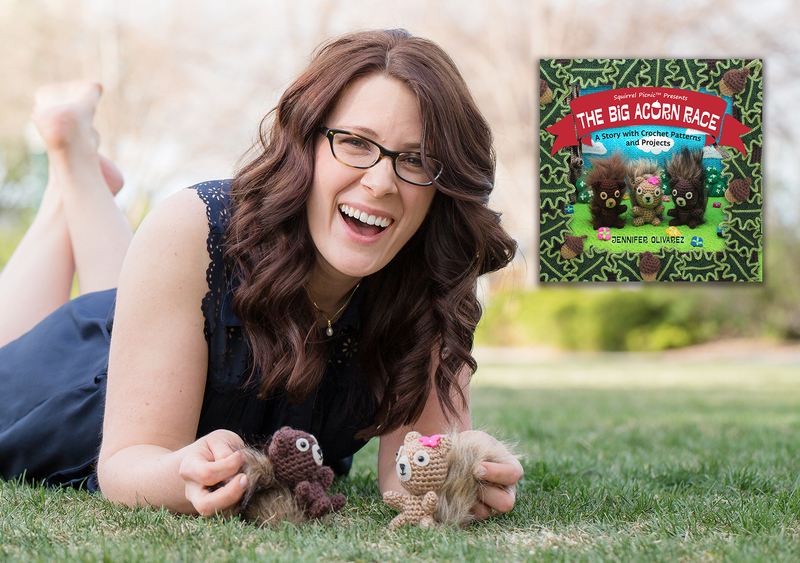 Kate Alinari and her crocheted friend Tipo Strano (in English, his name means “Oddball”) interviewed Hodge and Podge and I for her blog. Tipo Strano is from another planet. No really, he is! And he’s interested in learning about earth. He had lots of questions about squirrels. But we also talked about how Hodge and Podge came to be and about The Big Acorn Race, of course. We really enjoyed meeting Kate and Tipo Strano. Even though he is from outerspace, we found so much in common. In May, Liz Reed (one-half of the webcomic duo Cuddles and Rage) interviewed me for her podcast People I Think Are Cool. I don’t know if I’m really that cool, but I was so pleased to know that she does! We talked about Hodge and Podge and their friends around the world. I think I even mentioned some of you by name! We also talked about self-publishing, dioramas, cute things, copyright and police squirrels, and what it takes to pursue one’s passion. I think you’ll really enjoy our discussion. Liz is so sweet and funny. I had a great time talking with her. If you ever need a quick pick-me-up, just stop by their website Cuddles and Rage and take a look at their comics, especially the recent ones about food. They are always good for a smile! After the book was released, I felt a big desire to do something totally different. I needed to just let loose and crochet something big, wild, and without a pattern! I learned that the Crochet Guild of America was holding their annual design competition again this year in conjunction with their annual conference. They even had a theme: pineapples! Right away the wheels started turning on what I could do to make a giant pineapple. I’ve been really interested in crocheting 3-dimensional pieces with various stitch patterns and colors. So that’s what I did. 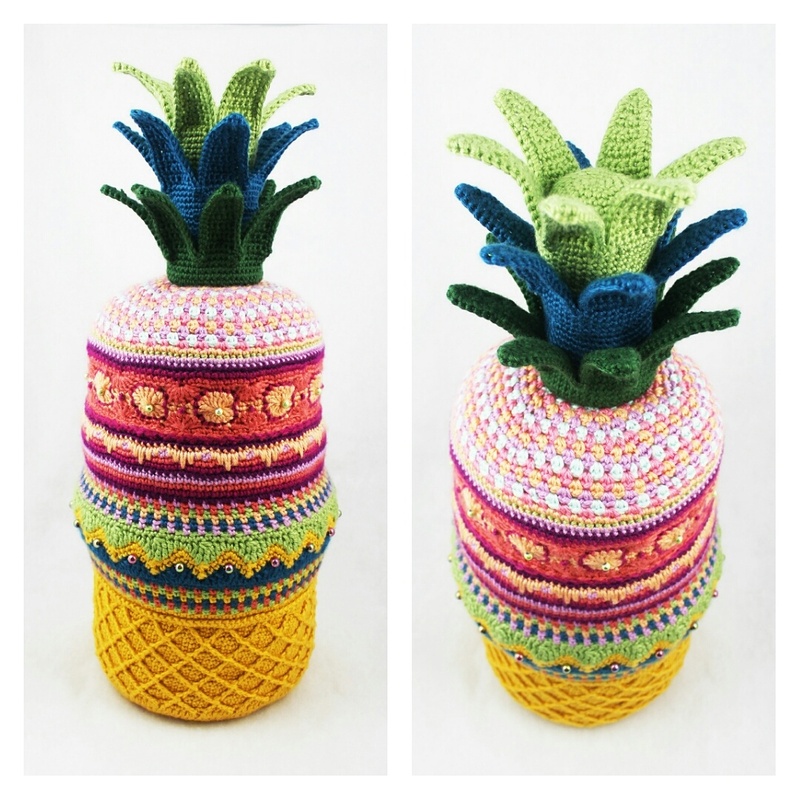 “Pineapple Sunset” is a sculptural crochet piece that is 36 inches tall and 20 inches around. It uses a variety of stitch patterns including the Catherine’s Wheel, eyelash, chevron, seed stitch, and lattice. I even worked the bottom with a spiral flower reminiscent of my Tall ‘n’ Fast Flower design. Perhaps the spiral is my signature element? I almost forgot the biggest news of all! “Pineapple Sunset” won first place in the Artistic Expression category! My apologies that I haven’t been able to get around to this yet. It’s been near the top of my to-do list all month! Our dear friend Sandy has made quite a few squirrels already this year and I noticed that she has been crocheting the tail using the tail from my snow squirrel pattern, but with a loop stitch. 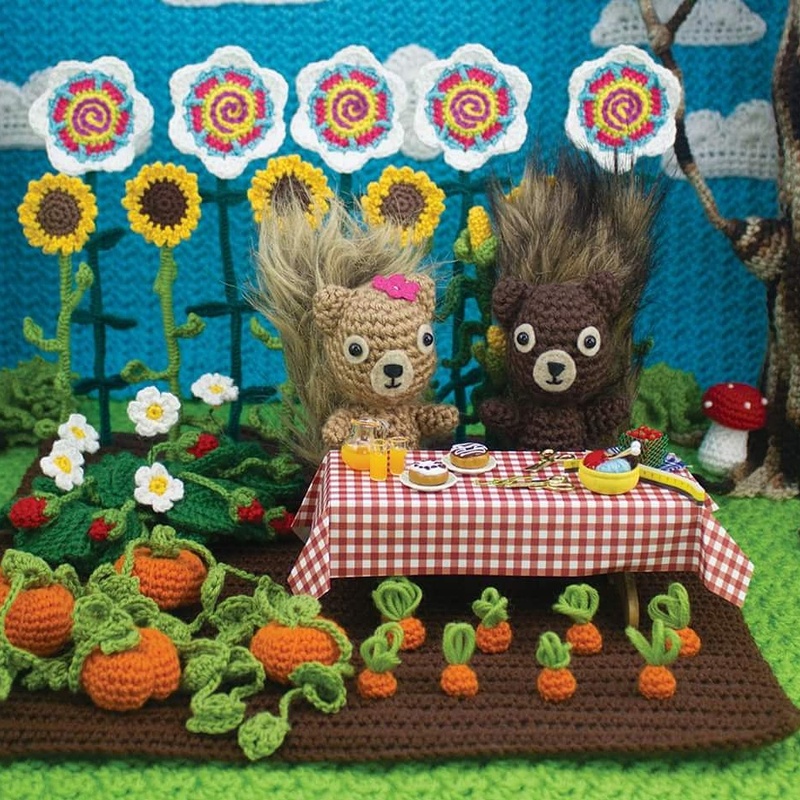 I really want to get a pattern and video tutorial up for this on The Big Acorn Race blog early next month. New Children’s Play Set Pattern! I’m working hard to meet a deadline to submit a brand-new play set pattern for consideration in a well-known crochet magazine. I think you will really like this design. It’s got lots of pockets for hiding toys and flowers that button on. Wonderful opportunities for busy little hands! I’ll keep you posted on where and when you can find this pattern. Next month I’ll be releasing free patterns for accessories for one of my favorite toys, Sleepy Bear! Then I have a huge surprise. A dear friend of the picnic, Maureen Speerly, has written a story about Sleepy Bear, which I plan to share with you. This will be in conjunction with a special call to action. It’s no secret that Sleepy Bear makes a great gift. He is so cuddly, just wrapping your arms around him makes you feel good. What a lovely gift it would be for a child in need to receive the bear along with a printout of her story. 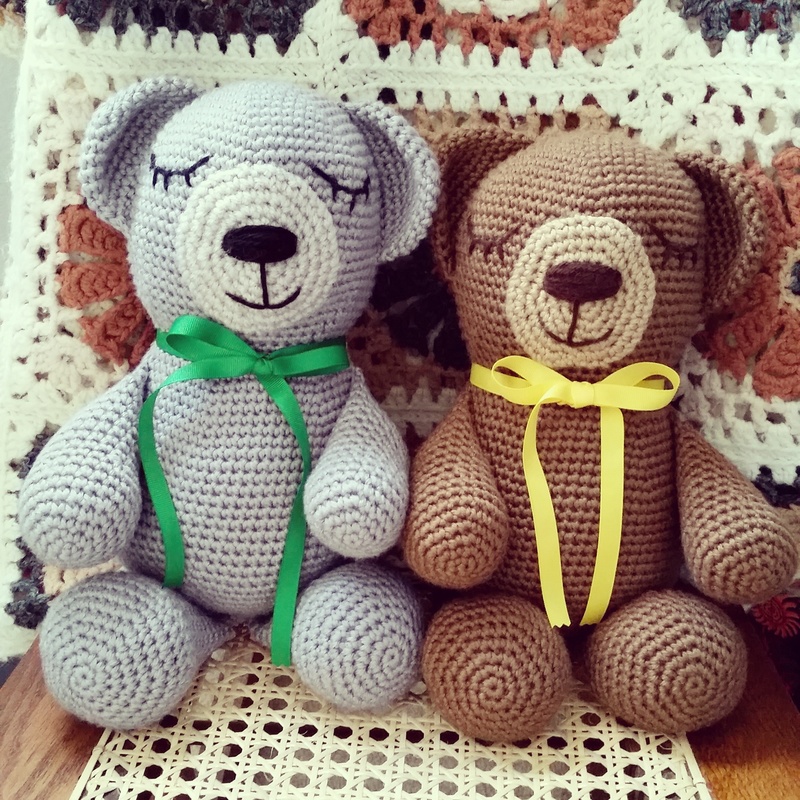 During this series, I’ll invite crocheters to make a Sleepy Bear for a child in need and I’ll offer suggestions for organizations that they might donate to if they don’t already have a specific child in mind. This call to action will be announced mid-August, so stay tuned for all the details and to get the pdf of Maureen’s story. I hope you all are enjoying your summer (or winter if that’s where you are). I can’t wait to finish up some of these projects so I can share more with you! 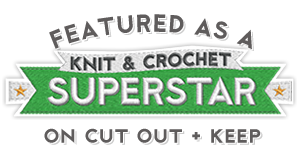 Categories: Crochet It | Tags: crochet, crochet art, Hodge and Podge, interview, sculpture, Sleepy Bear, teddy bear | Permalink. Hi Kate! I’m so glad that you saw my post today. It was so much fun talking with you earlier this year. I know you and I and our crochet characters will be lifelong friends! I’m so sorry to hear about your dad. You message really hit home for me. That’s exactly why I wanted to go on this trip with my dad. It is a time I will always treasure. It is good that you have some wonderful memories of your dad as well. Hold on to those, tightly! Lots of love and hugs to you! What a fun trip you had! I am going to google those places and in particular, the railway. I think the pines are wonderful and I have always loved sleepy bear. I have been having fun with lambs and tweaking my lambs story and plan to update the story and post the lamb pattern over the weekend. The Big Acorn Race will be available in our local library tomorow and the city library in the next week or so. I will send a pic of them on the shelf at some time. Hi Sharon! The Alaska Railroad was a lot of fun. We saw most of the wildlife from the train! They also employ high school kids to narrate the trip. I learned a lot from them. Your lambs are adorable and the story was so sweet. I can’t wait to see them again. Thanks again for working with your local library to include The Big Acorn Race in their collection. What is the name of the library? I would like to send them a thank-you. You are so sweet. Thank you! Here I am!! I listened to your interview some days ago but didn’t have time to sit down and write my impressions up till now…. oh, I do not work but still can’t understand where I spend all my time… anyway…. I loved so so so much to hear you and to learn about the huge background The Big Acorn Race has ( by the way, it was ‘ ARCON’ for me for a very long time…). I haven’t realized it was such an enormous work and you did an excellent and amazing job with your book indeed! Chapeau!! Now I understand much more your hesitations about the translation in Italian. Hi Tajana! Thank you so much for listening to my interview with Liz. It was a lot of fun. Reflecting on all that the book required was very gratifying, but also exhausting just to think about! Yes, I have been thinking more about your offer and I don’t think that now is the right time. Perhaps in the future it will be easier for me to pursue an Italian translation, and then I would love to work with you on it. That was so sweet of you to offer. Until then, we will crochet to our hearts content! Hi there! I'm Jennifer Olivarez and these two little squirrels are Hodge and Podge. Whether you’re looking for whimsical patterns, lighthearted comics, or something to smile about, you’ve come to the right place and we're so happy you're here. This work is licensed under a Creative Commons Attribution-NonCommercial-ShareAlike 3.0 Unported License. So much love and hard work has gone into these patterns, comics, and tutorials, so please respect the Creative Commons Copyright.